In this tutorial we’ll focus on creating a simple HUD – a more detailed introduction to HUDs will be added later. First of all we need a new GUI box to display our HUD. We want to display the HUD in the lower right corner of the screen – so open the ORK Framework editor and navigate to Menus > GUI Boxes. Copy the Battle Menu GUI box and change the following settings. Set to X=1280, Y=800, W=200, H=50. Navigate to Menus > HUDs and change the settings of the Default HUD (the first HUD in the list). This type allows us to display information about a combatant, e.g. status values. This will display a list of all members – each member will be displayed in it’s own GUI box (with an offset). Individual would display the GUI box at each member’s game object position. The HUDs for different combatants will now be relative to the upper right of the previous combatant’s HUD, with an offset of -5 vertically. Enable Player and disable the rest. Set all other Game States to No. A HUD consists of one ore multiple HUD elements. 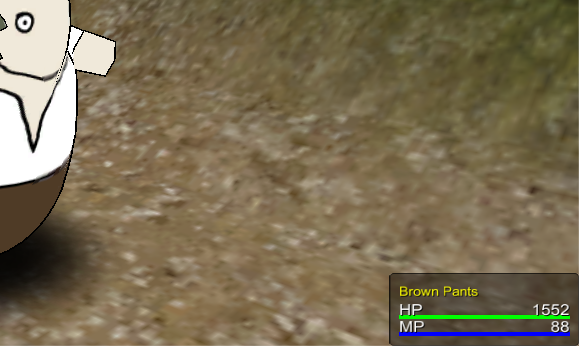 In our case (Combatant type HUD), it consists of multiple Status Elements. The drawing order is from first to last – i.e. the element with index 1 will be placed above index 0. First we want to display the combatant’s name. Click on Add Status Element to add the first element – change the following settings. This type let’s us display information about the combatant (e.g. name, class, etc.). This will display the combatant’s name. The Element Bounds define the size of the HUD element and where it’ll will be positioned within the GUI box. HUD elements can also be anchored to their previous element. Now we want to display the Consumable type status values as bars. We will define the default look of those bars later in the status value settings. Click on Add Status Element to add another element. This will display information on one or multiple status values. The value origin defines where the displayed status value’s value comes from – you can use this to display how status values would change when changing equipment. Current will only display the status value’s real value. This will list multiple status values of a defined status value type. This is the offset added to each status value. We’ll anchor this HUD element to the previous element. In case the previous element changes in size, this element’s position will be updated accordingly. Additionally, we want to display the name of the status value – to make things easier, let’s copy the previous element. Change the following settings. Finally, we also want to display the values as text – copy status element 2 and change the following settings. And that’s it for our HUD. While we could define the colors/images used for our status value bars in the HUD as well, it’s better to do this in the status value settings – this way they’ll look everywhere the same. For now we’ll only set this up for HP and MP – navigate to Status > Status Values and change the following settings. We can change the look of the bars depending on how much they’re filled – we want the bar to be red when below 25 %, yellow when below 50 % and green for the rest (50-100%). The first added bar will always represent 100 % – the following are in descending order (e.g. 100, 50, 25). Change the already added value bar settings. Since this is the first value bar, you can’t change this setting anyway. We also want to display the empty part of the bar. This is a black color. Now, click on Add Images to add another value bar setting. Click on Add Images to add the last value bar setting. The MP should always display the same value bar – we don’t need to react on it’s filling. Open the main menu scene (0 Main Menu) and hit Play. Walk outside of the town and into the battle – you’ll now see the player HUD displaying at the lower right side of the screen. Wow – now our battle is fully animated! At least for now … there’s always something to play around with. This concludes our animating the battle marathon. And that’s it for now – the next lesson will continue with combatant groups and turn based battles. Add camera position changes to ability and item battle events.